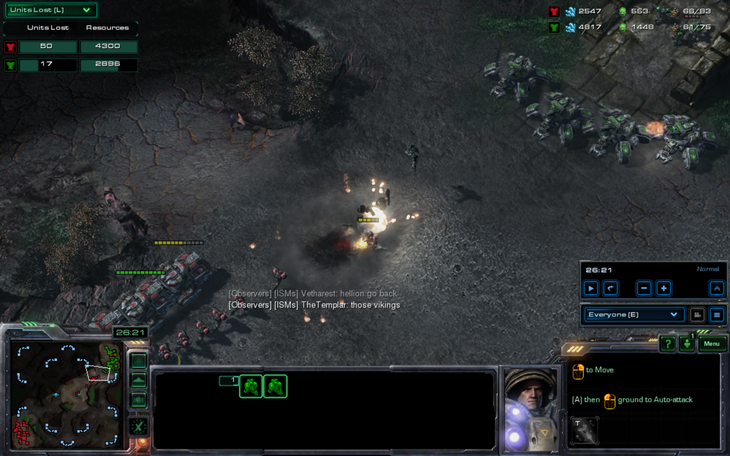 During Thanksgiving Break, I attempted to save eSports by reminding my family why I played Starcraft. We all enjoyed ourselves and played some team games, FFAs, and 1v1s that didn't involve me. None of them are very good players, with the best of them managing to stay in silver league, but they all have their own ideas as well as preferred unit compositions and strategies, and they have lots of fun doing whatever they feel like, leading to entertaining games when their ideas clash with stuff they had never considered before. 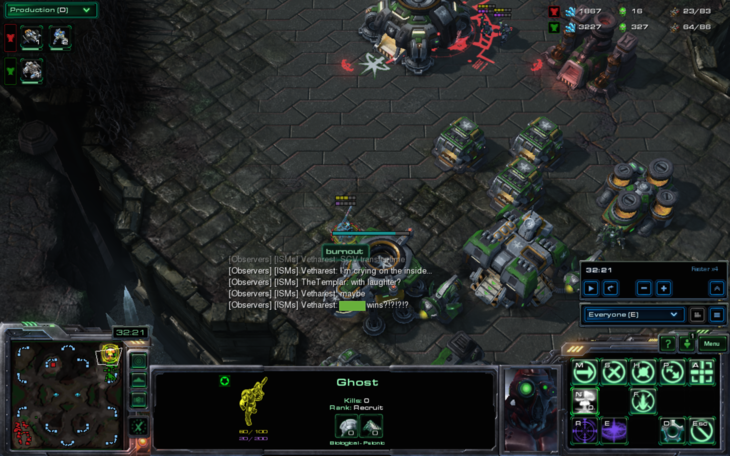 One of my brothers, who will be referred to in this blog as Vetharest, is one of the best players in our family, as he occasionally manages to nearly win games in silver league as Protoss or Terran. 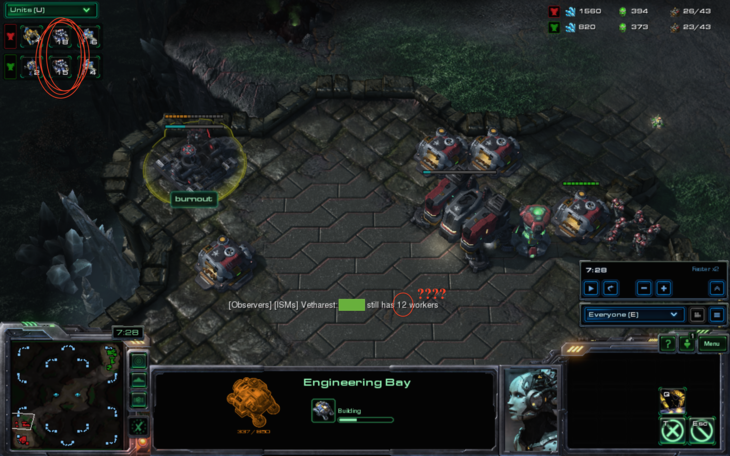 While we don't talk about his Zerg, he is one of the players that understands that he needs to expand and make more and more production facilities, workers, and units constantly. 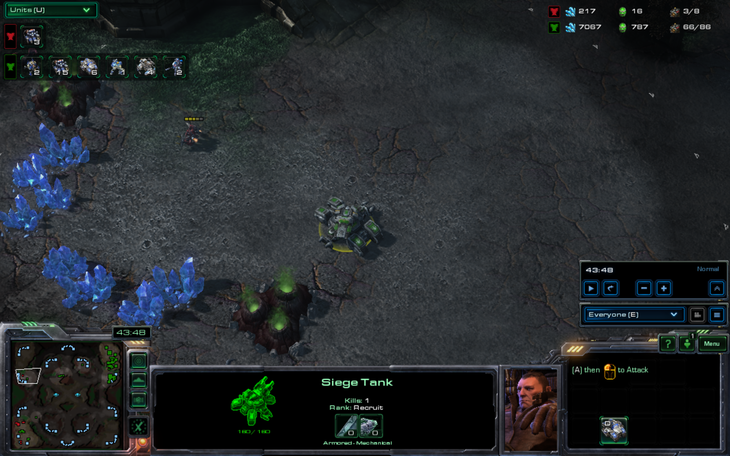 He might even eventually do something with his units besides grouping them up and attack moving. 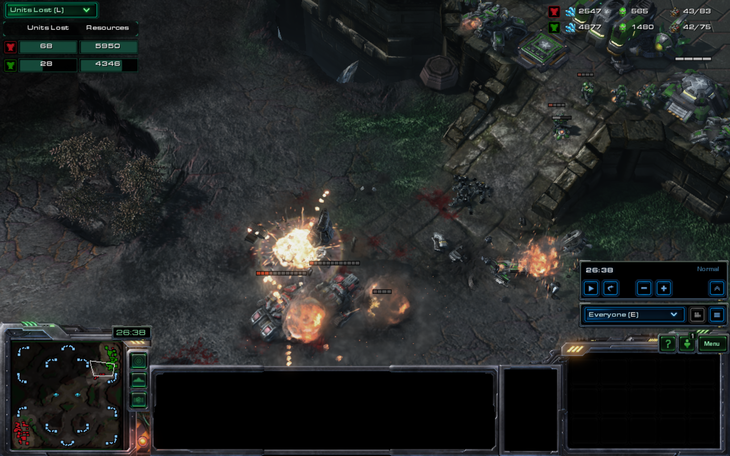 He attempted to teach his friend burnout, who had expressed interest in playing Starcraft before, how to play Terran over the break, with some success. 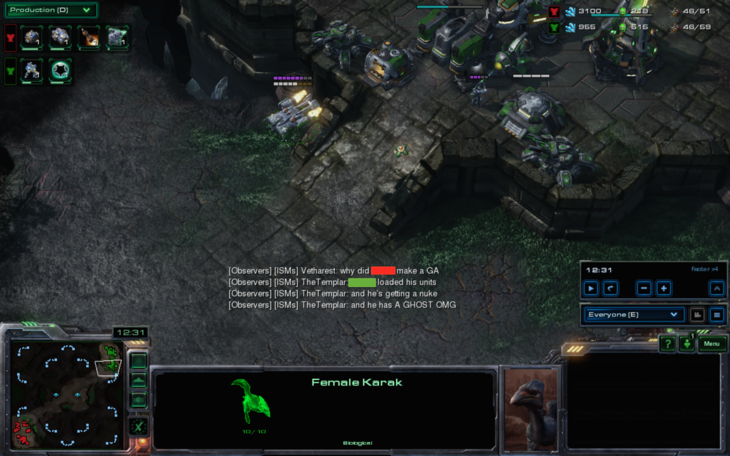 Meanwhile, another one of my brothers (there are a few of them) was learning starcraft in his own way, also switching between Protoss and Terran since my family in general hates Zerg. He did not like to make production facilities, workers, or really anything in general. 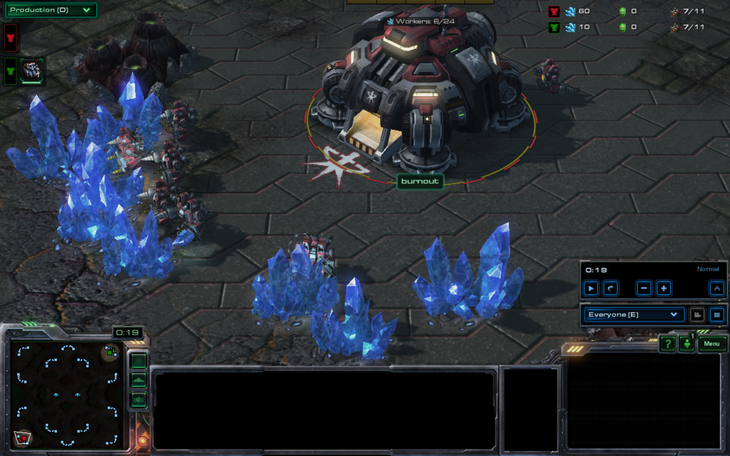 As protoss, he commonly made nothing except cannons in a 30 minute game. I suppose this strategy makes some sense- you don't have to micro cannons. 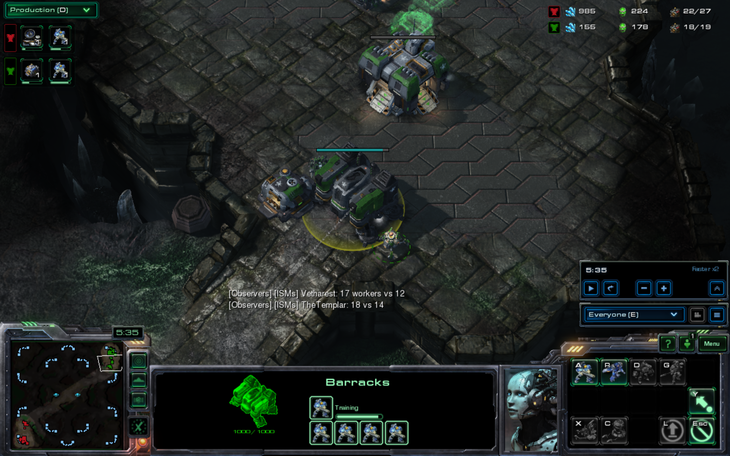 He also plays a lot of tower defense games, so cannons are probably really familiar compared to the rest of the game. This brother was known as TimeTraveler, and he had started playing during the summer of 2014. One of the games we played was above the others in how interesting it was. While any game that involved me was generally a one-sided stomp, putting the two indisputably worst players out of our group against each other led to very interesting results. Burnout, the new and inexperienced player, would face TimeTraveler, who had a few interesting ideas about how the game should be played. 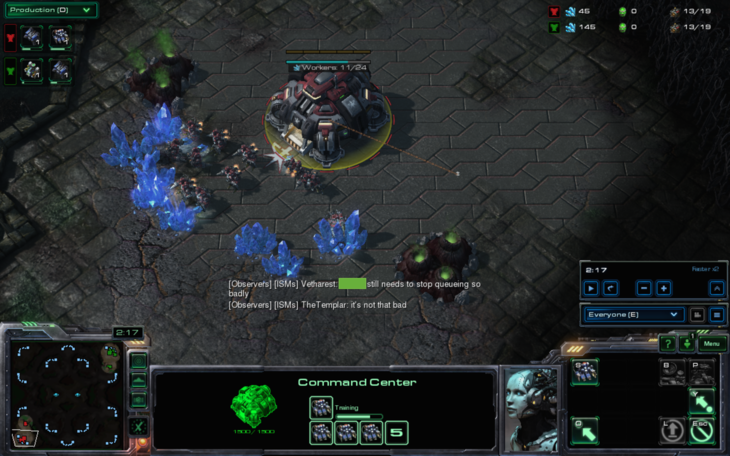 I refereed the game, and since TimeTraveler had more SC2 experience than burnout, I attempted to find the only map that would not give either player an advantage or a disadvantage. Typhon Peaks was this map. Nobody cared about or even thought about this map outside of its short career as a bad ladder map. Perfect for two players that picked up the game this year. 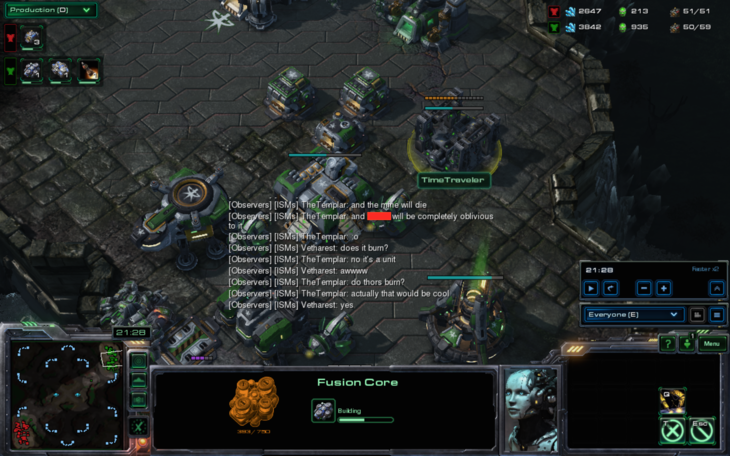 TimeTraveler picked terran, as his cannon rush in an earlier FFA had angered burnout immensely and nobody wanted to repeat that incident. 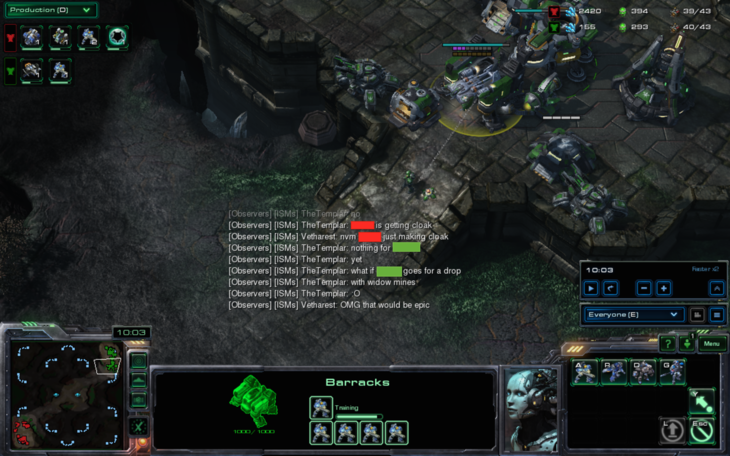 In this game, Vetharest and I chat a lot, as we were all next to each other or on Skype. We also refer to each other by name. To protect the totally guilty people in this game, I have censored any mention of their real life names based on their player colors. 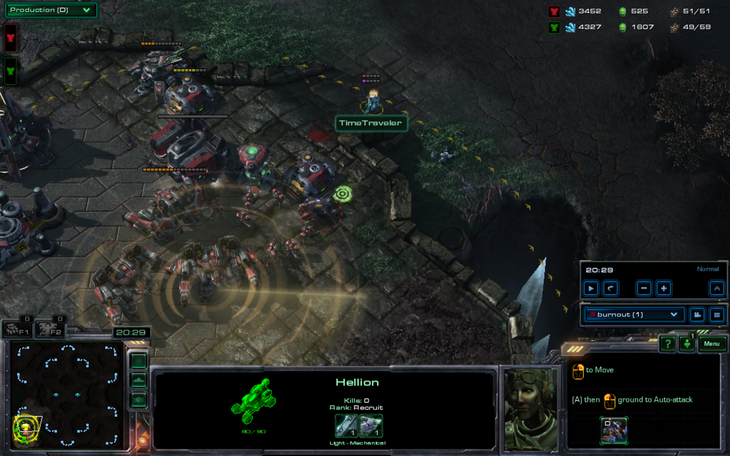 Burnout spawns as the red terran in the bottom left, while TimeTraveler is the green terran in the top right. For some reason, the incredible amounts of hype behind this game caused the screenshots to become blurry. Actually, I have no idea why this happened. 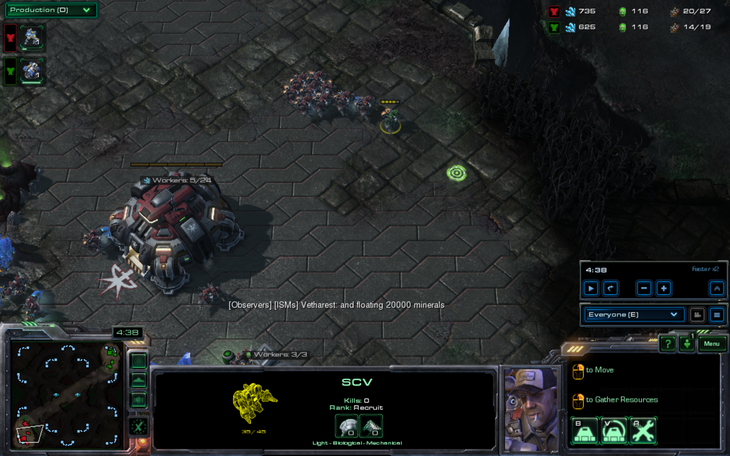 We see here that burnout has rallied his SCVs to the side, relying on amazing Brood War micro to send the SCVs straight to the minerals. This is most peculiar, because he has never had to split his workers. I guess the technology wasn't there yet. 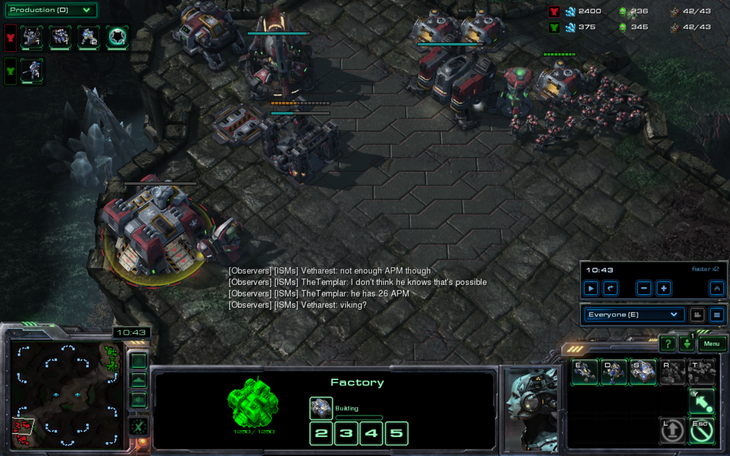 Meanwhile, he has set a world record by queueing up four workers before his barracks finishes. 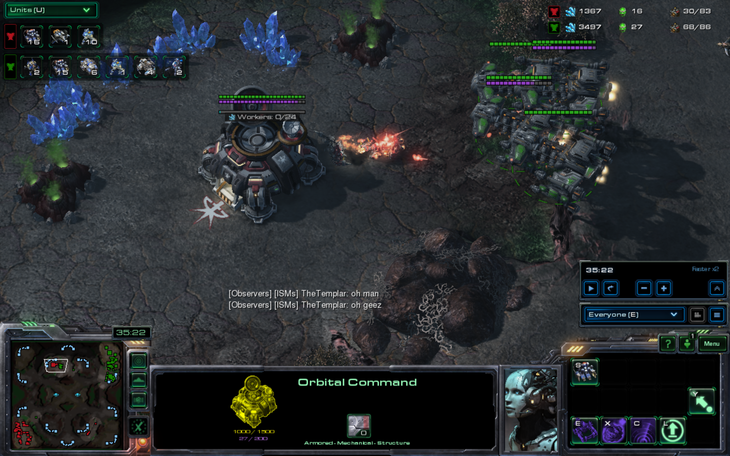 Meanwhile, TimeTraveler has sent his SCV to patrol between the bottom left base and his main base. This is an effective tactic of scouting every three minutes, provided your opponent doesn't bother to kill your worker first. 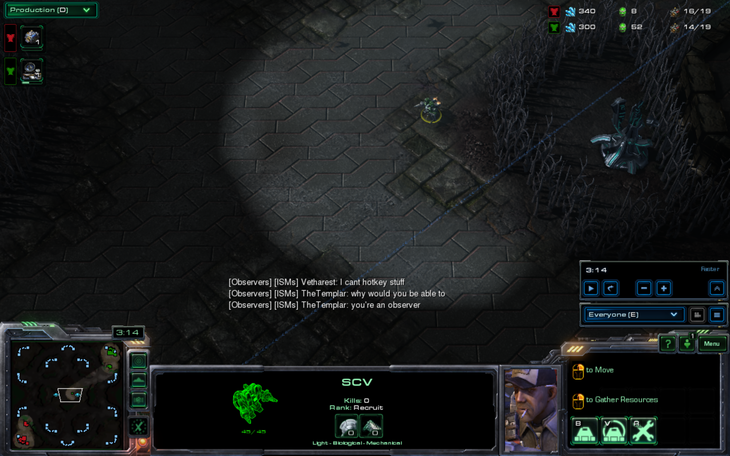 Vetharest laments that he can not hotkey stuff as an observer. Vetharest explains that he'd like to keep tabs on things as an observer. 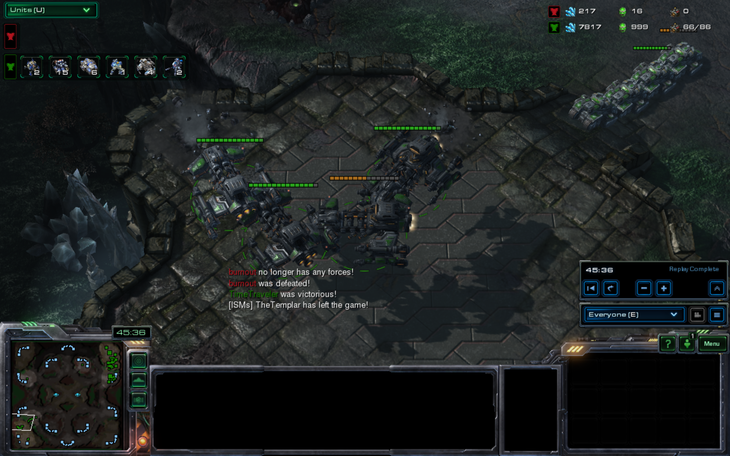 I tell him that observing is easy and that he can use his mouse to find stuff since he doesn't have to actually play the game. Meanwhile, TimeTraveler climbs up the tech tree at a rapid pace, getting a factory on 14 workers before even making a marine. Already he is playing very well. Normally he'd have a few missile turrets by now. TimeTraveler gets an SCV into burnout's base, and burnout does the only sensible thing. He sends almost all of his workers towards the SCV. Meanwhile, Vetharest is ranting and raving about floating 20,000 minerals, which is ridiculous because only Zirk has the ability to play that well. Zirk has the ability to float 90,000 resources. No, that is not a typo. There was a heated argument about the worker counts. Vetharest has difficulty with math, or something. I felt obligated to correct him. 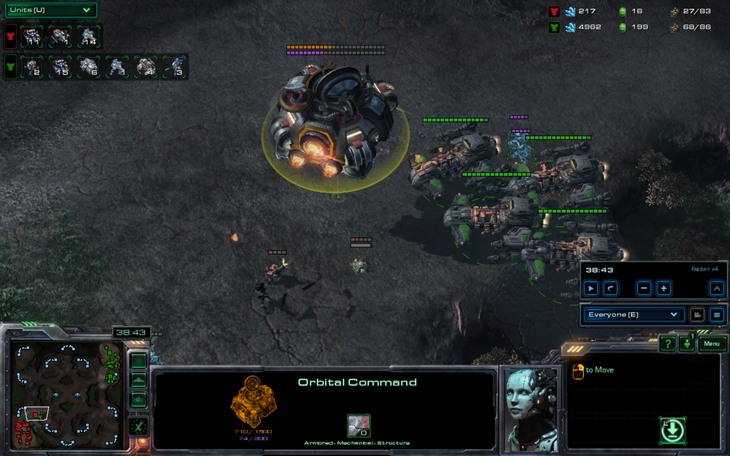 Meanwhile, TimeTraveler is getting a widow mine, which is probably a great idea against a player that has not played this game much. 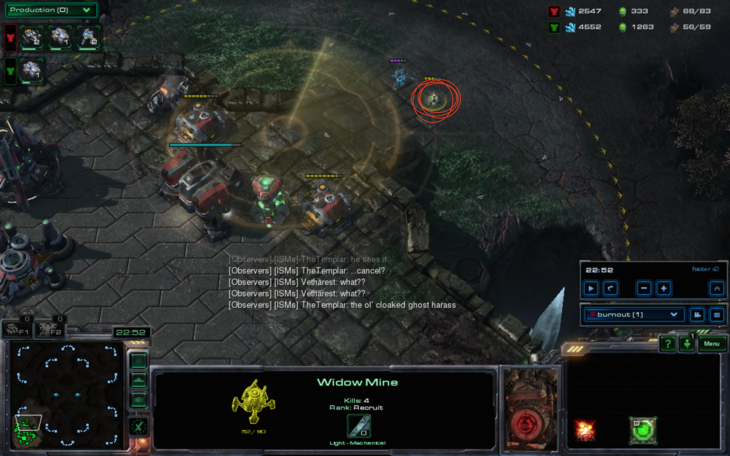 In fact, burnout had never seen a widow mine in his SCII career (which consisted of a few silly FFAs and a 1v1 against Vetharest. 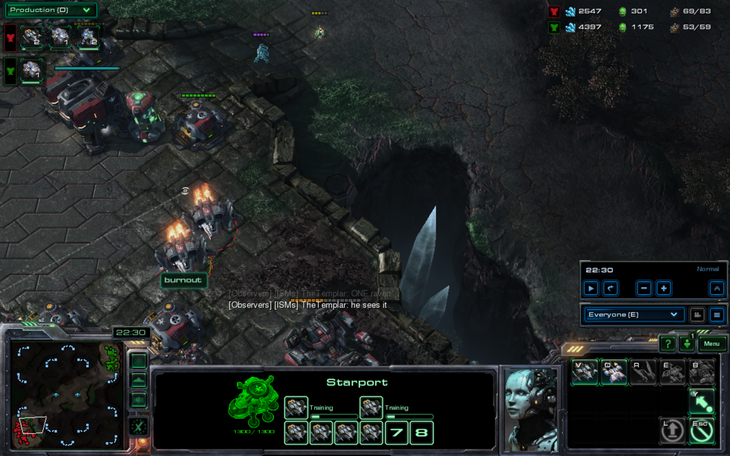 Vetharest killed him with mass battlecruisers). 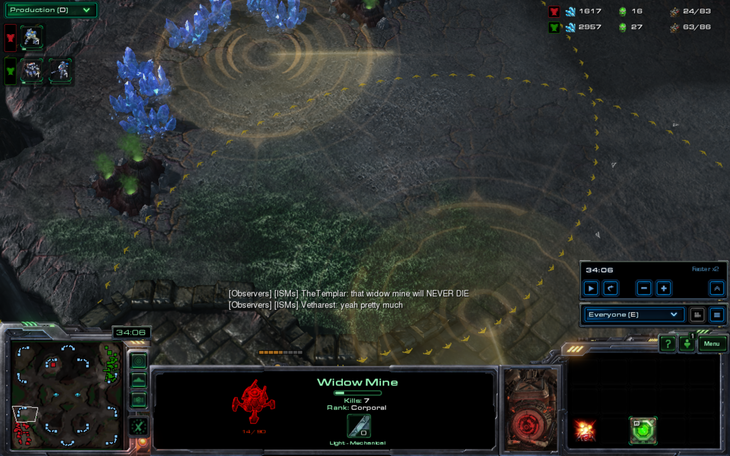 Suddenly, I realized the power of the widow mine. 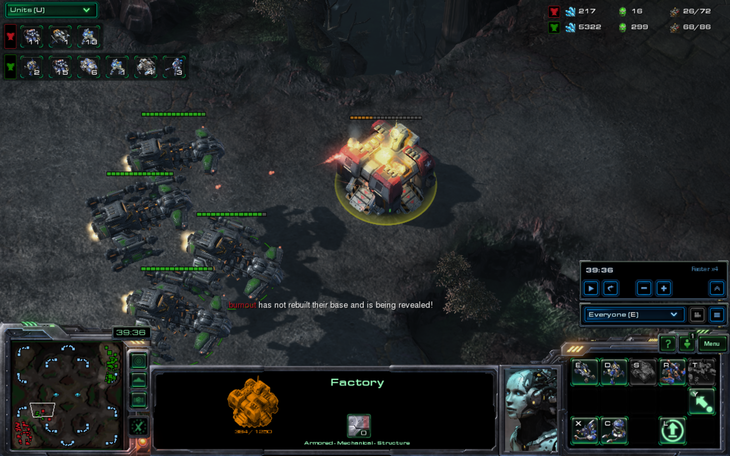 TimeTraveler seemed to understand too, as he moved out with a terrifying 1 mine, 1 marine army. The marine charged into the main and died to four marines. Actually, I think TimeTraveler was trying to get vision in order to hit burnout with his mine. Look at the positioning. If you don't look carefully, that looks like it could hit marines on top of the ramp. 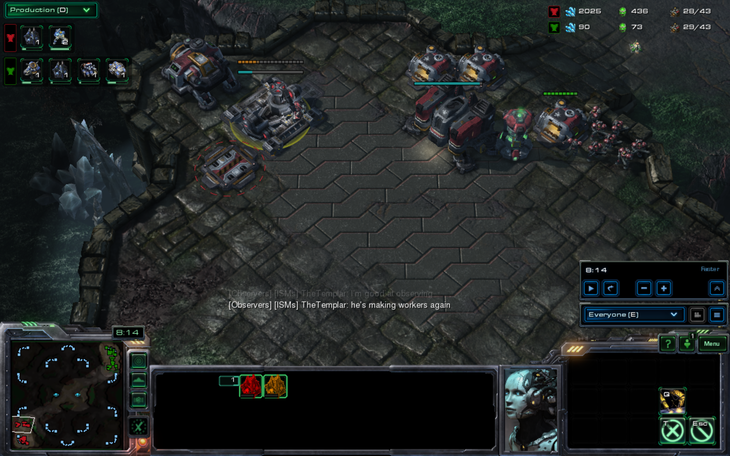 1 marine loses to 4 marines? I call imbalanced. 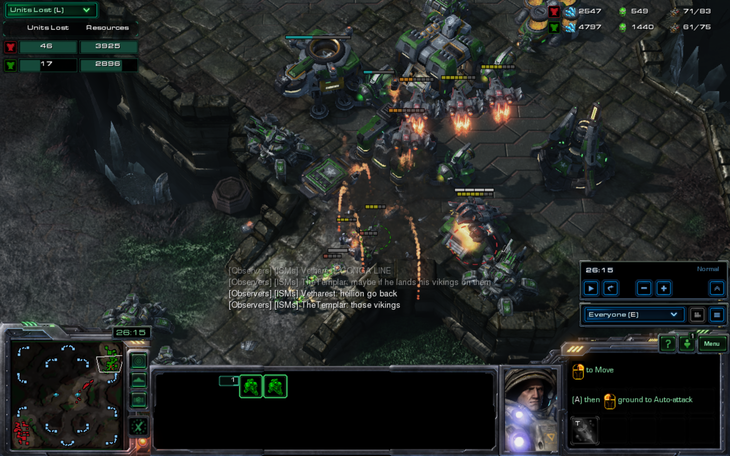 While this glorious, epic, terrifying, legendary, massive battle of amazing tactics and glorious macro, multitasking, and usage of high ground as well as unit abilities raged on, Vetharest was still trying to count the workers... unsuccessfully. Which of 18 and 15 is 12? Teach me o math wizard. Suddenly, the players' grand plan is revealed. 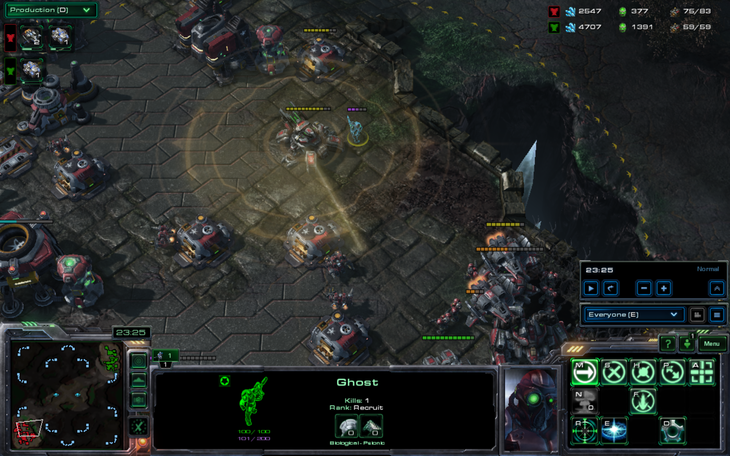 Through extensive strategical insight, both players determined that the best strategy in this game was to go ghosts on one base. 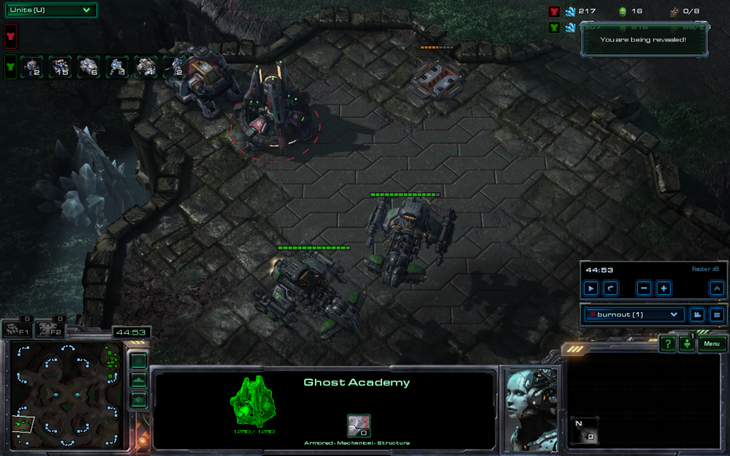 This is an effective strategy that I often use in 3v3, but my variant generally requires three ghost academies so that nonstop nuclear missiles can be launched. Clearly, both of them have cooked up a more economical version of the opening. 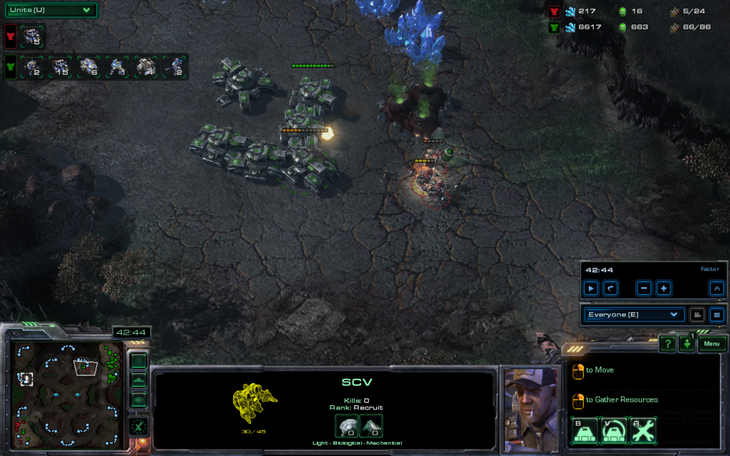 Additionally, TimeTraveler gets more SCVs, possibly for an expansion. TimeTraveler has, however, gone for a very safe opening, getting two seiged tanks at his wall before doing anything else. 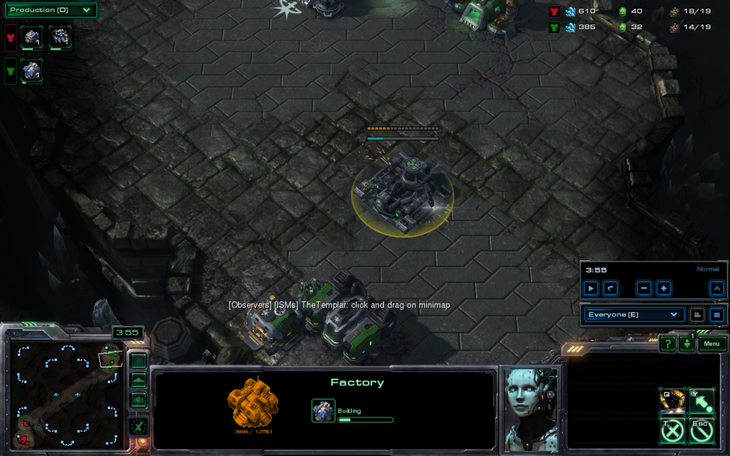 The accuracy of this build is apparent as he is is floating almost no money, meaning his macro skill is GM. 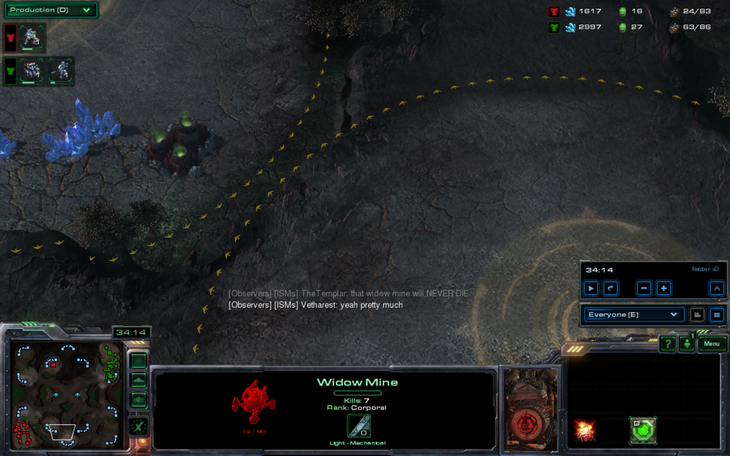 TimeTraveler has a medivac and a widow mine. 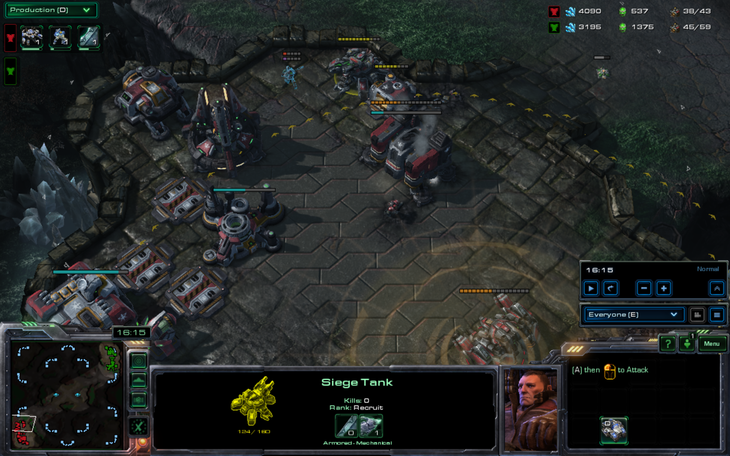 Since he seems to be going for a tank based build, this is clearly either mech or mass tank with a widow mine drop. 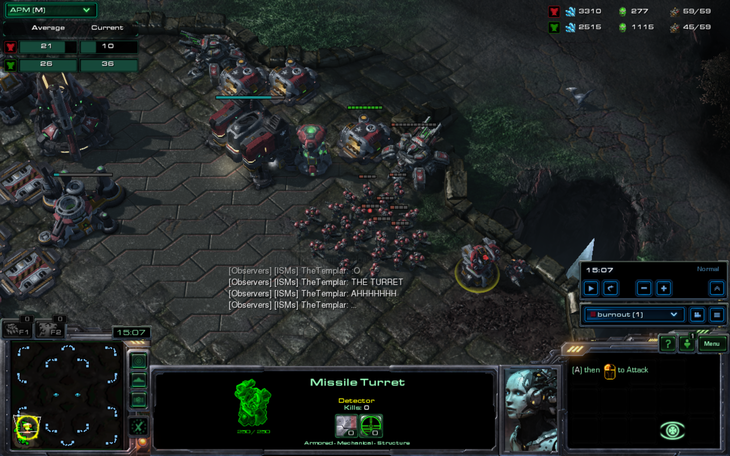 Since TimeTraveler is a protoss player at heart, he should know that mech is extremely weak, so this can only be one thing. However, the observers, who are really talkative, do not think that TimeTraveler has the sheer efficiency and APM required to execute this brilliant strategy. 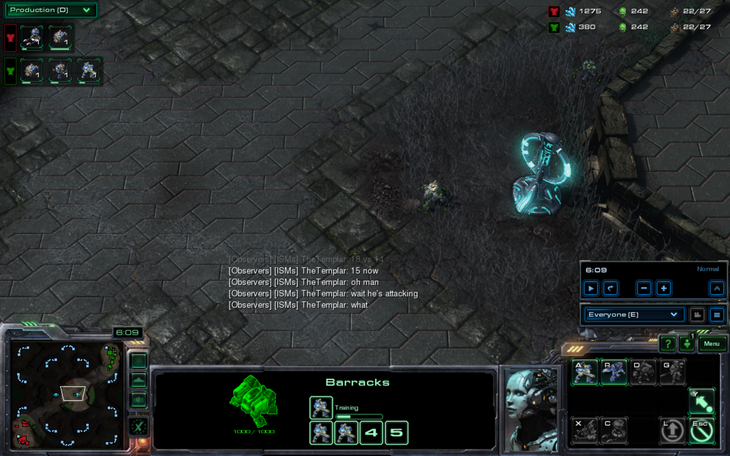 However, TimeTraveler seems perfectly content to go with a 5 marine drop. Burnout's units are all the way on the other side of the main base, so this strategy should do an amazing amount of damage, crippling the burnout's massive one base economy on 18 workers. Perhaps anticipating that burnout was going to set up defenses in normal drop areas, TimeTraveler dropped his units in front of the main in an amazing tactical move. However, burnout was already in position with a tank and the drop was deflected. 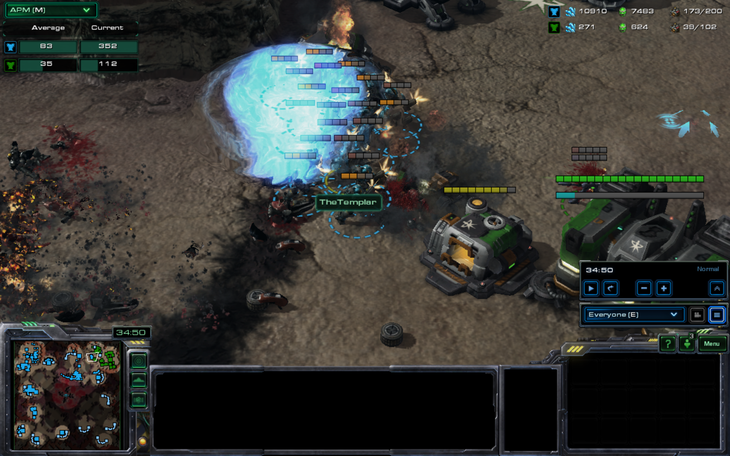 TimeTraveler drew blood with a nuke that killed a tank and a large group of burnout's marines. Even though burnout had a turret at his ramp, TimeTraveler somehow managed to position his ghost on the other side of the ramp, using amazing strategical thinking, placing himself outside of the turret's detection range. Burnout has no idea what's coming. Unfortunately, the resulting damage of the nuke involved too much gore to appeal to the general audience of young children. Even TimeTraveler, who is a manly nine years old, had to temporarily look away while the nuke decimated the lives of people that are probably not fathers or husbands. TimeTraveler, upon looking at his screen, saw that there was an opening in the wall and the turret was dead, so he snuck inside. Burnout had just finished a thor, and TimeTraveler immediately started shooting at its thick armor with a sniper rifle. However, he was unsatisfied, and EMPd the thor. Vetharest EMPd my marines in a previous battle report game. Not pictured: Me EMPing my own ghost and Jer99's raven at the same time. Burnout tries scanning to find the ghost, but it runs out of range and burnout becomes eternally frustrated. 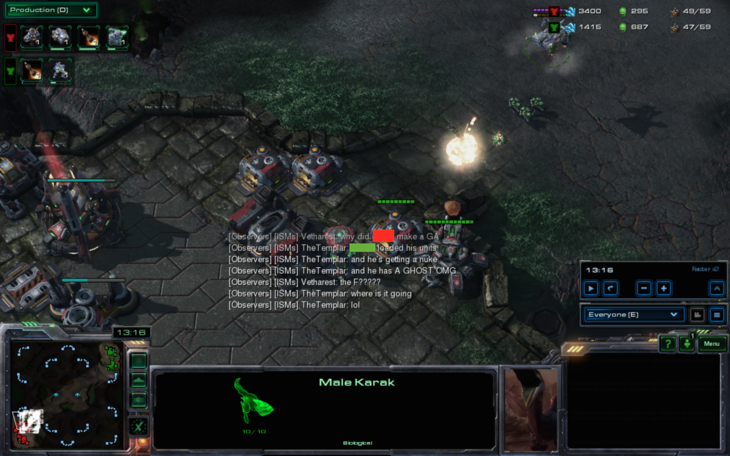 "But pro terrans don't need ravens, so neither do I!" is probably what burnout was thinking. Burnout responds to this nuke strategy by going mass vikings. This actually works out fairly well when, upon moving out with two vikings, he found a tank + 2 ghost drop. 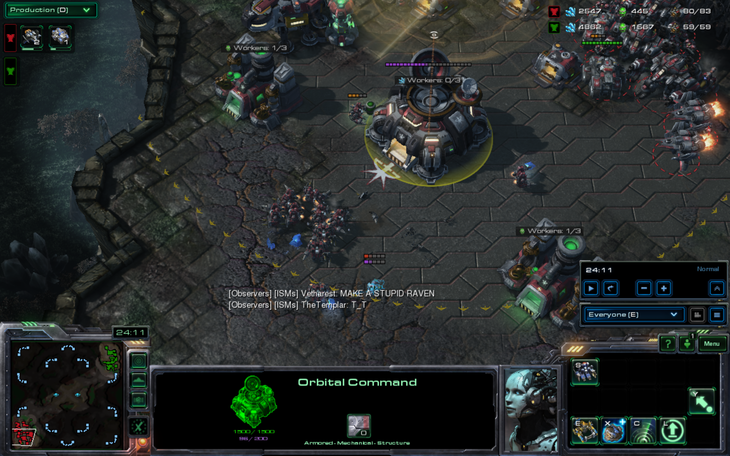 This is basically Mvp vs TOP, where TOP finds Mvp's medivacs before they land. 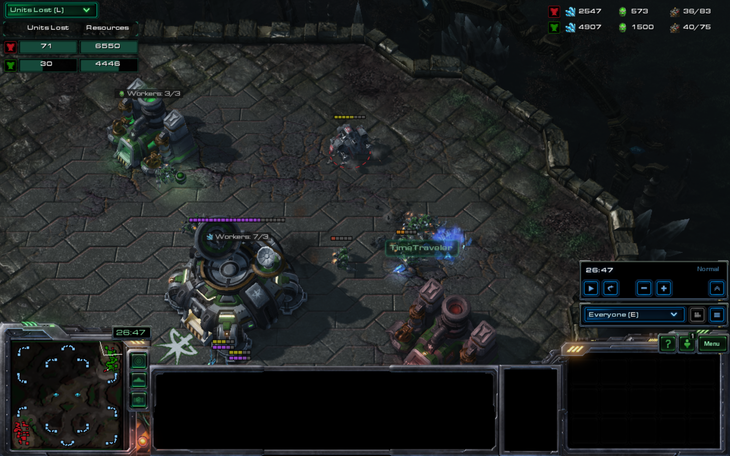 TimeTraveler lands his units immediately and sieges the tank because ESPORTS. The vikings, upon killing the medivac, attempts to land to kill the tank. However, the ghosts manage to out DPS the vikings so the tank survives. As if by magic (I forgot about it), the tank disappears, and the one of the ghosts goes in to attempt to nuke burnout's base again. However, burnout immediately scans and sees the ghost, forcing it back. 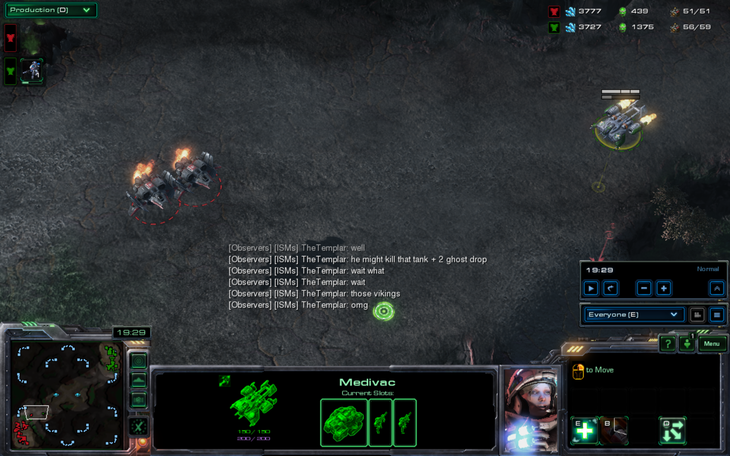 TimeTraveler executed a miraculous piece of strategy and ran his ghost back into scan range in order to attempt a nuke. TimeTraveler unveils the next stage in his plan, going BCs. Meanwhile, burnout still hasn't seen the mine outside of his base, only managing to damage it due to friendly tank fire. 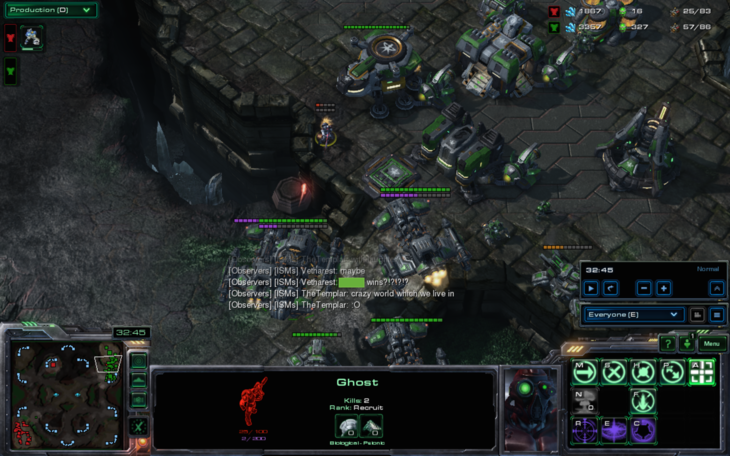 The ghost zoned out the tanks so that they couldn't kill the mine. 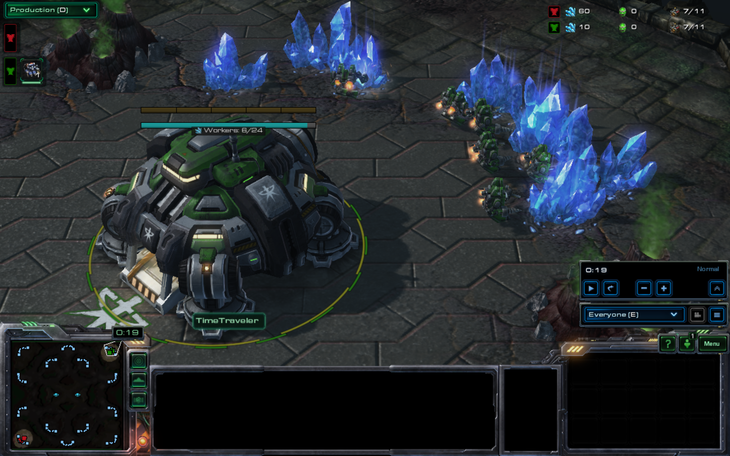 Amazing tactics from TimeTraveler. The ghost somehow evades several scans despite being right next to the entire army of burnout. However, it died to the entire army of burnout. In death, it never said die. Burnout decided that enough was enough. No longer would he, with his amazing army of thors and vikings, be sitting at home. No, he would bring down the hammer, mostly by using Norse mythology. Although, I do not believe that Vikings had tanks or marines, so this analogy fails somewhat. However, he was slightly lacking in micro, and he accidentally sent all of his vikings into a bunker. The rest of the army hardly fared any better than that. A viking gets into the mineral line of TimeTraveler. There's not a whole lot to kill, though. 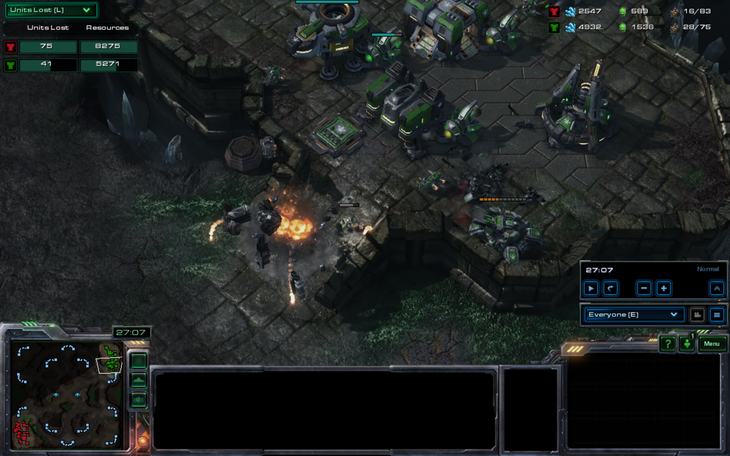 Meanwhile, burnout's 3 thors magically become BW dragoons as soon as they reach the ramp, and they barely kill a bunker. This marked the end of burnout's tragic attack. If this was a pro game and it was 26 supply to 16 at 27 minutes, people would be going nuts. Vetharest was unable to contain his laughter at the events, leading to a poker face comment. Meanwhile, I note that neither player expanded and we're at the point that they should be on about 5 bases each. While this isn't terribly uncommon in PvP, both of them have actually mined out their main bases, meaning there are a lot of workers sitting there idle. This is ok though, because TimeTraveler made a battlecruiser. 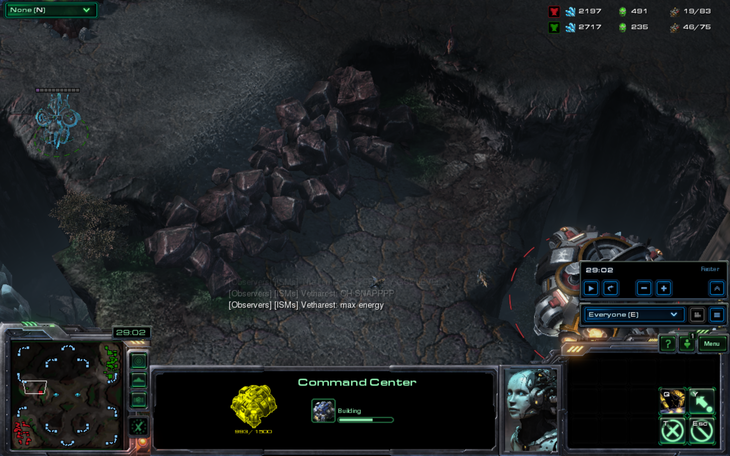 However, TimeTraveler proves to be the smarter macro player in this extremely tense situation, as he manages to construct an entirely new base. This doubling of his economy is probably nothing you've ever seen since you started reading this battle report. As you can see in the chat, the hype is real. Burnout tries a different tack, lifting his command center to a random corner of the map. 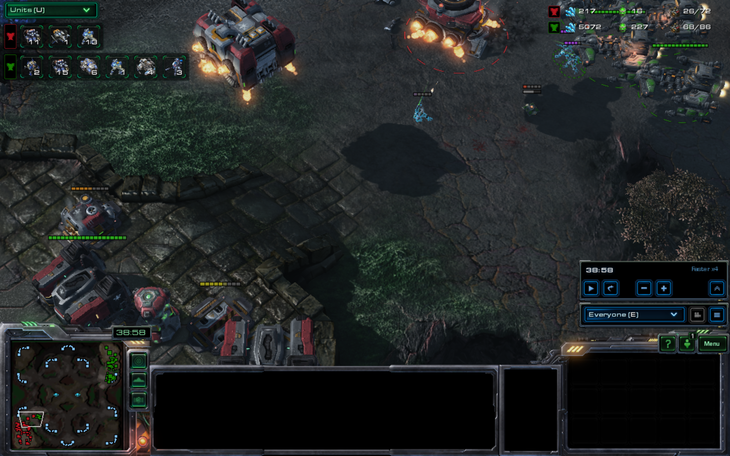 This plan nearly backfires when a banshee nearly misses it. 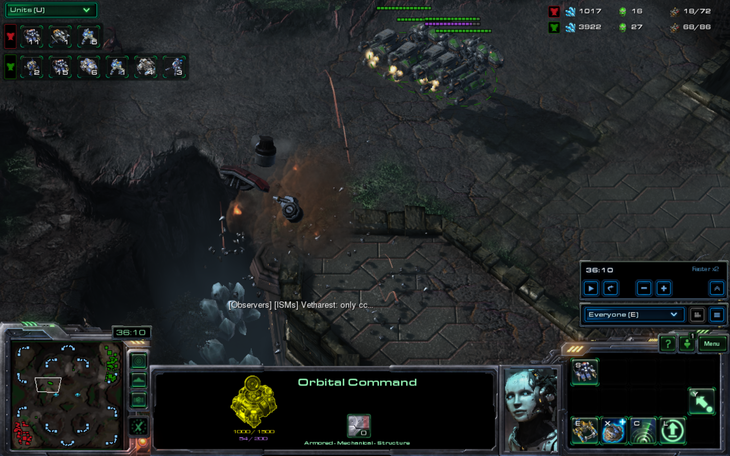 After relocating his CC and landing four MULEs, burnout launches a nuke in TimeTraveler's base! Nowhere near the tanks and battlecruisers, of course. Eventually, it is no longer the ghost's time. 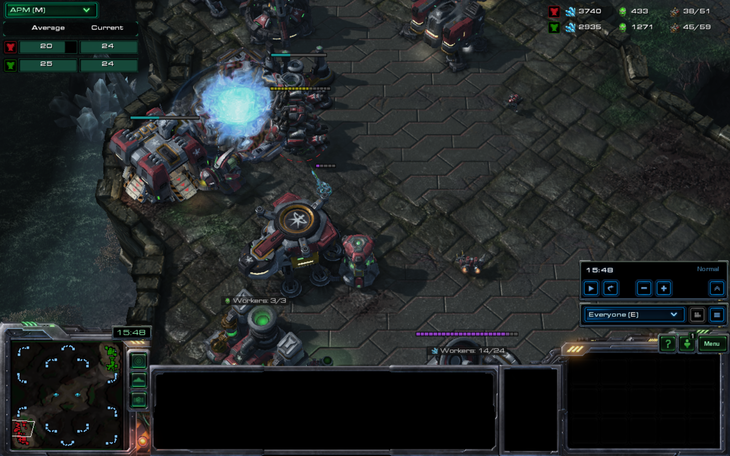 Battlecruisers defeat it as its last traces of power slip away. Could TimeTraveler actually win the game? 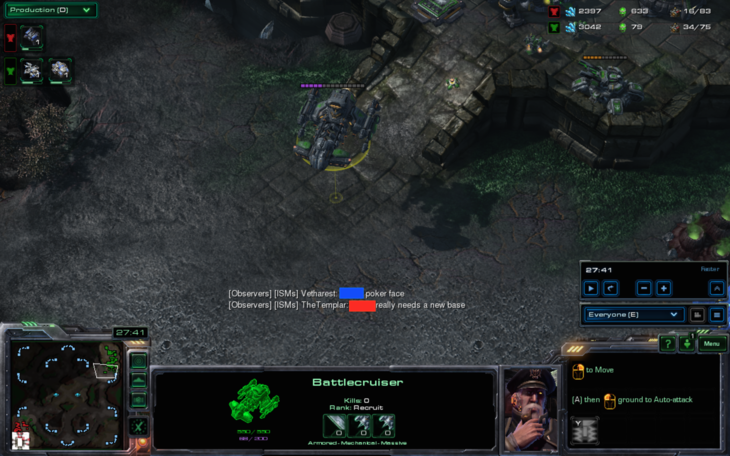 He had never won a single 1v1 before, previously losing to Vetharest at 50% health, and he had never actually made units of a higher tech than marauders before. This was truly a game of firsts. TimeTraveler does a sweep of the bottom left to determine how victorious he might be in the near future. If he was playing against me, I would have taken every base besides those three. The battlecruiser force moves out, immediately intercepting the command center of burnout. This leaves him with fewer and fewer options. For one thing, he actually has to build a second base. The second command center does not do much better. While staring in the face of death, burnout sees only one option besides gg. 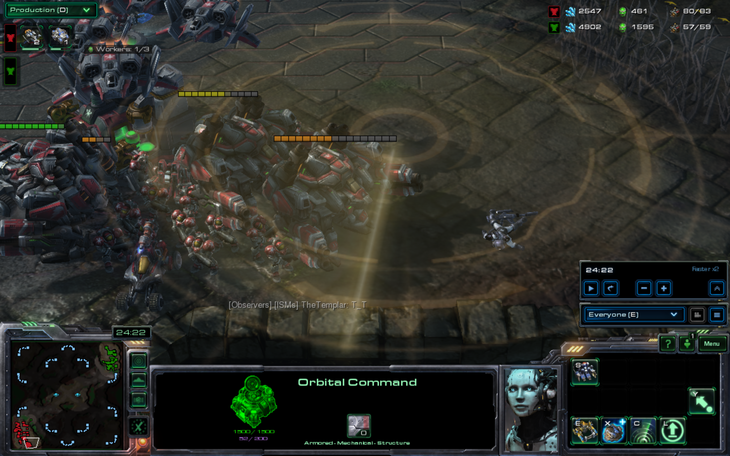 He quickly lifts all of his buildings and sends them at the battlecruisers. However, since flying buildings can not attack, he decides that landing them will be more effective, in the hope that they may transform into planetary fortresses that shoot air. This is not very effective. In desperation, burnout pulls workers and goes for an all-out attack right into siege tanks. Reduced to one SCV and no command center, as well as no money, burnout makes an epic journey across the world of Typhon. He sees peaks. 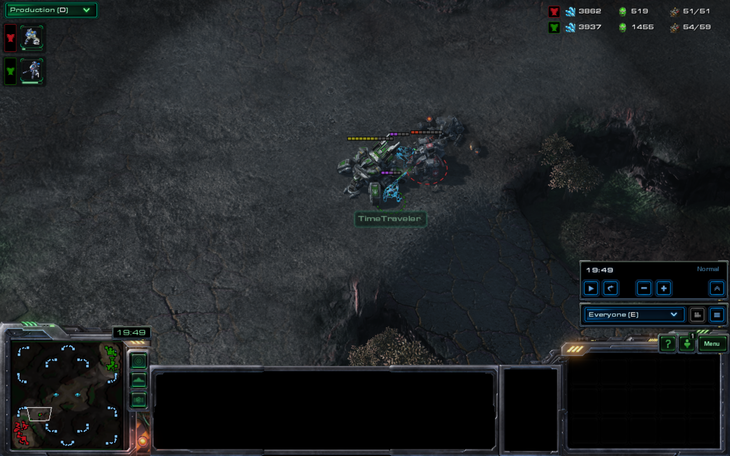 However, TimeTraveler stealthily sieges a tank next to the SCV and destroys it. Things look grim for burnout. 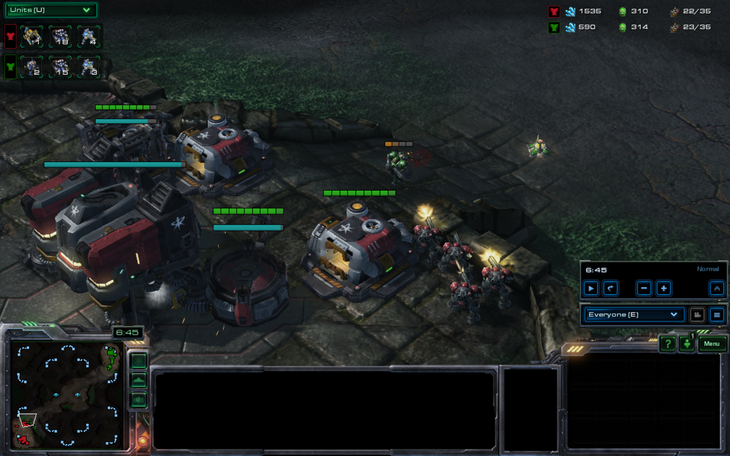 But even with no units, he refused to give up, at least until the battlecruisers eliminated his buildings. The humiliation of losing to TimeTraveler, who was normally way worse than he was here, was too much for burnout to handle. He immediately jumped into the 1v1 ladder and lost a 53 minute game that was almost very similar this one before rage quitting. 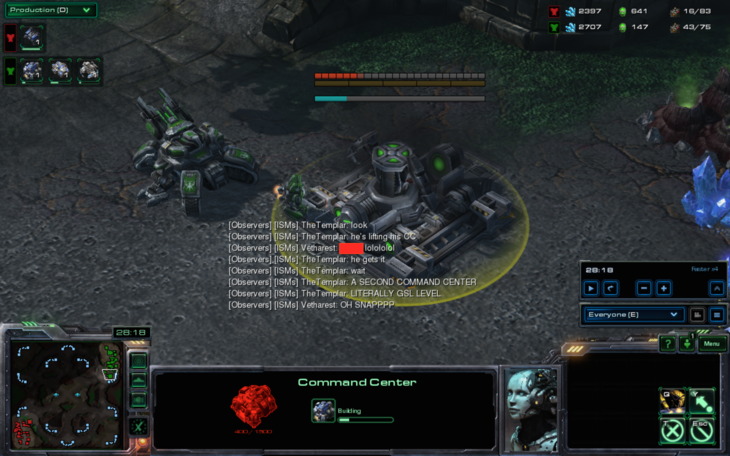 Meanwhile, TimeTraveler played as protoss against computers and cannon rushed. And thus concludes another epic chapter in ESPORTS history. 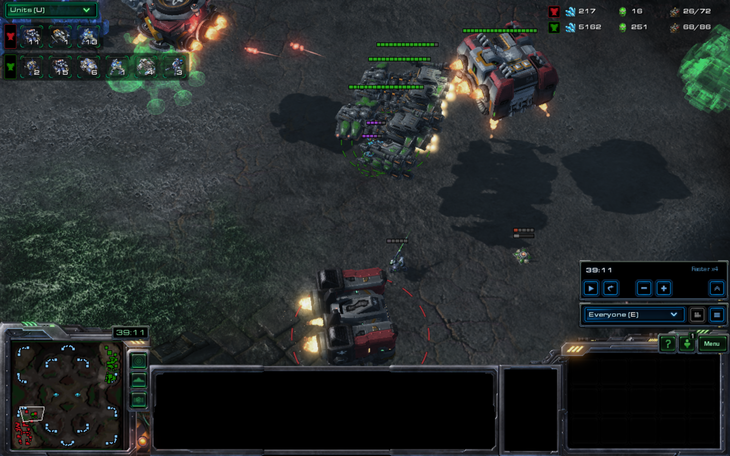 That stealth siege vs the SCV rofl. Calling this bronze is an insult to bronze players.